The current A Troop will deploy to Afghanistan next month. 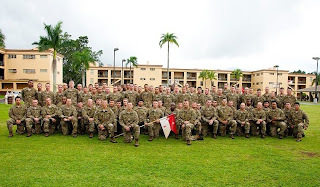 For some background the troop commander, Cpt Adam McCombs has made contact with us and desires to connect the current troop members to those from the past. He recently held a pre-deployment dining-in dinner for the troops and their families. He ask a few of us to make video comments about the troop's time in Vietnam. Several of us (Mel Moss, Art Ryan, and I) did that for him. Art Bonevich donated his A troop guidon from 1966 that was displayed at the dinner and will accompany the squadron to Afghanistan. Cpt McCombs has provided us with the names of the troopers going on the deployment to Afghanistan. He has troopers in the troop from PV1s to 1LTs. What we would like to do is have enough of us to sponsor one of the troopers during the deployment so that each one will have at least one of us to communicate with. At a minimum you would need to write the trooper a couple of times a month. Later on we might need you to send a goodies package, calling card, or other items that Cpt McCombs feels the troop needs. I think we all remember how important contact with home was during our tours and hope you can sponsor one Apache Trooper. If we end up with more than what is needed then some troopers will have a couple of sponsors. This will not start right away. Once the deployment to Afghanistan is completed, Cpt McCombs will send the APO address to us. Former A Troopers please contact me if you are willing to sponsor a current Apache Trooper during his deployment. 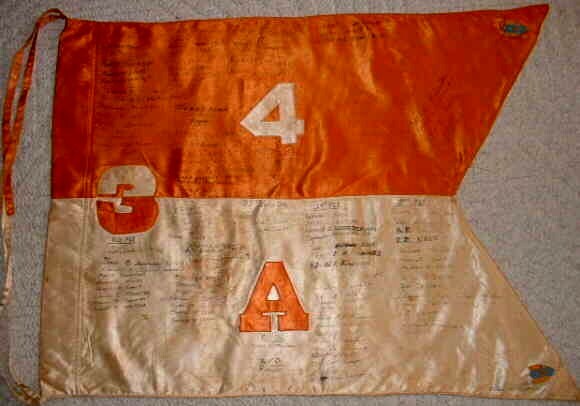 "I just received the A Troop guidon you sent. With your permission, I want to take it to Afghanistan and use it as a historic item of display. I will photograph it in various ceremonies giving it a service life of over 45 years. I have inspected it and have deemed it serviceable for the mission. At the conclusion of the deployment, I will frame the guidon and use your photos and those that I take to illustrate its long 46 year history to the Squadron. been called to action in Afghanistan. This is a great honor for all of us that served with A Troop 3rd Squadron 4th Cavalry in the past. We appreciate the squadron's efforts to reach out and connect to former troopers. Thank you CSM Kiefer. Best wishes for a safe deployment, return to your loved ones and do great things. You are in our prayers. Thank you all for what you do. Crisp Family Super Bowl Party for Veterans & Active Duty. For the super bowl this year the Crisp family of Cota de Coza, CA hosted a super bowl party for Veterans & active duty Marines. We posted an article on this previously. This is a follow-up video of the event. Manny Montanez, A Trp 68/69 helped plan and host the party. Manny makes some comments during the video. Several A Troopers attended.